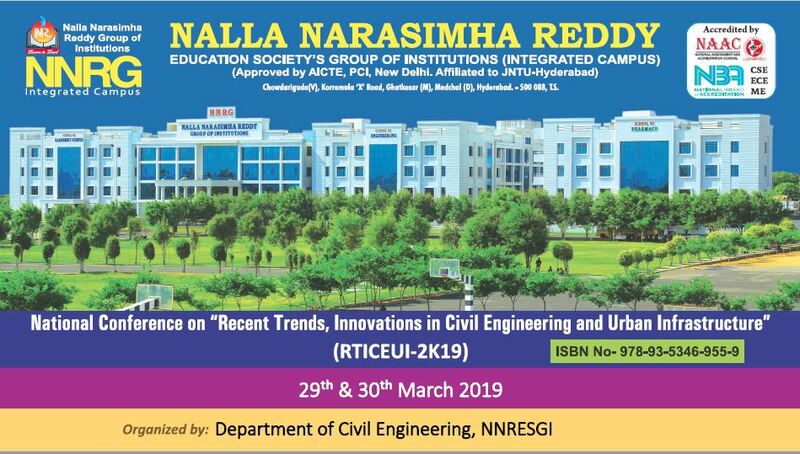 ☞ 29th & 30th March 2019 3rd NationaL Conference on “Recent Trends, Innovations in Civil Engineering and Urban Infrastructure (RTICEUI-2K19)” - Organized by DEPARTMENT OF CIVIL ENGINEERING. ☞ 29th & 30th March 2019 A Two Day National conference on “ Innovations and Emerging Trends in Management Sciences(IETMS-2019)” organizing by School of Management Sciences-NNRG. ☞ 22nd & 23rd March 2019 A National conference on ” Computing, Communications and Electrical Engineering” organizing by Department of Electrical and Electronics Engineering-NNRG. ☞ 15th & 16th March 2019 3rd National Conference on “Recent Trends & Innovations in Mechanical Engineering (RTIME-2K19) “ organised by Department of Mechanical Engineering. ☞ 1st & 2nd March 2019 2nd National Conference on "Recent Advances in Electronics & Communication Engineering – (RAECE-2K19)" organizing by Department of ECE. ☞ 22nd & 23rd February 2019 2nd National Conference on “Convergence of Emerging Technologies in Computer Science & Engineering(CETCSE-2K19)” – Organized by CSE Department. ☞ 10th & 11th January 2019 A Two Day National Level Students’ Technical Symposium “Tech Samprathi-2k19”. 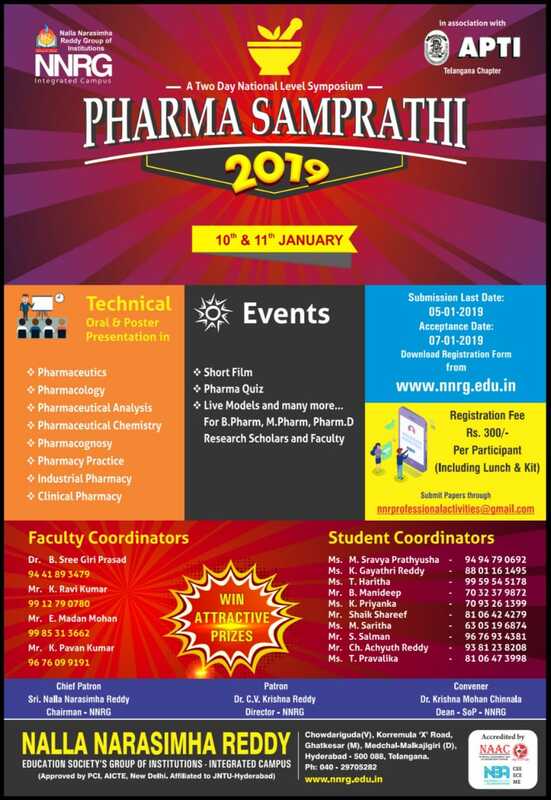 ☞ 10th & 11th January 2019 A Two Day National Level Symposium “Pharma Samprathi-2019” in association with APTI.